Hans Solo sits alone in a hollowed-out tree . . . .
Our lonely owl woke us at 5:30 a.m. recently, singing his annual mating call. We listened intently, hoping to hear a response but to no avail. Last year he failed to nest and raise a family, although he spent the month of January in the company of what we presumed to be a lady friend and we were able to photograph them on several occasions. We sighted him in the treetops from time to time during late summer and autumn, and once winter set in he perched on a regular basis in a cottonwood tree directly above our office window. We have high hopes he will find a mate and build a nest where we can watch from a distance as he raises his young. Perhaps we need to go online and search for a lonely owl dating site where we can solicit a partner for poor old Hans Solo. 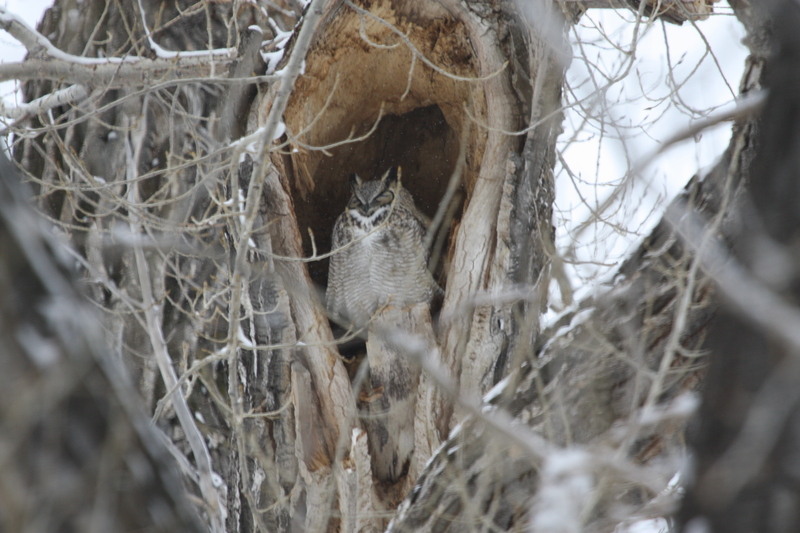 This entry was posted in Wildlife blog and tagged Great Horned Owl seeks mate by bygeorge. Bookmark the permalink.